Build a multi-level fire in your grill: Leaving 1/4 of the bottom free of coals, bank the coals in the remaining 3/4 of the grill so that they are 3 times as high on one side as on the other. When the coals are all ignited and the temperature has died down to medium (you can hold your hand about 5 inches above the grill grid, over the area where the coals are deepest, for 4 to 5 seconds), you're ready to cook. In a large sauté pan or skillet, cook the bacon over medium-high heat until it has rendered a good amount of fat but has not yet begun to color or crinkle up, about 4 minutes. (You are looking to cook the bacon about halfway  you want it to remain pliable.) Remove from the heat. Thread the scallops onto skewers, putting three on each skewer. 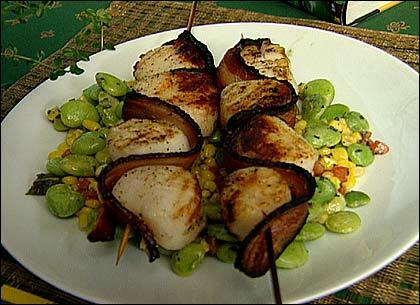 Wrap a piece of bacon around each trio of scallops, securing it at the top and bottom with toothpicks. Sprinkle the skewers generously with salt and pepper, then put them on the grill over the side with fewer coals and cook until the scallops are opaque all the way through, about 5 to 7 minutes per side. Meanwhile, melt the butter in a large sauté pan over medium heat. Add the corn, lima beans, tomato, sage, and salt and pepper to taste. Sauté, stirring occasionally, until all the ingredients are nice and hot, about 5 minutes. Place about 1/4 of the succotash on each plate, top with 2 skewers, and serve. Chef Chris Schlesinger notes: be sure to use the largest scallops you can find in this recipe  and if you can find dry scallops, so much the better. Take it slow when cooking the bacon-wrapped skewers, putting them on the cooler side of the fire and watching carefully for flare-ups.